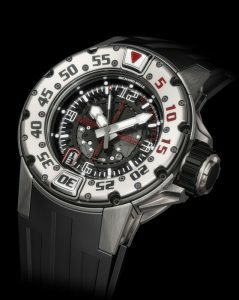 At the beginning of 2009, Richard Mille entered the world of the ocean depths with his premiere diver’s watch, the RM 025 tourbillion chronograph. This exceptional piece also marked the first entrance of a round case within the collection. Today the brand presents a new automatic diver’s watch, the RM 028, in a slightly smaller diameter of 47 mm. Following the lines set out by the RM 025, the new RM 028 with its exceptional case and skeletonized movement possesses all the incontestable qualities that typify the watches of Richard Mille. Following diver’s watch ISO norms 6425 with its water resistance of 300 meters (30 ATM) and a unidirectional bezel, the seemingly simple lines of the round case of the RM 028 conceal a considerable amount of technical know-how. The exceptional water resistance is achieved with a three part case construction and torque screws, with complete integration of the lugs into the case system. Turning unidirectionally to prevent miscalculations whilst diving, the bezel is composed of three sections assembled with 22 torque screws, making it impossible to accidentally dislodge from the case. The skeleonized automatic movement of the RM 028 utilizes a rotor with variable geometry, a major innovation of Richard Mile that allows the level of automatic winding to be adjusted to the user’s lifestyle via the setting of two 18ct white gold wings. Like the RM 025, dedicated to the marine world of diving, the automatic RM 028 is in all ways an integral part of the collection, immediately identifiable as a typical creation of Richard Mille Watches. Skeletonized automatic movement with variable rotor geometry, hours, minutes, central seconds and date. Available in titanium with titanium lugs and rubber bracelet.